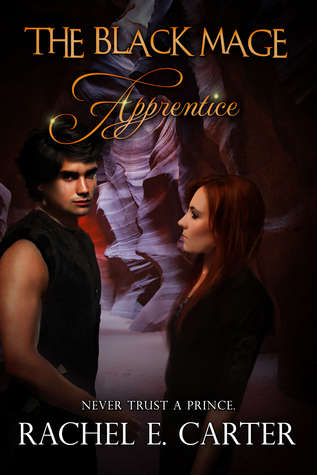 Now sixteen-year-old Ryiah is an apprentice in Combat, her school’s most notorious faction of magic. When she finishes she will be a mage, but in order to do so she has to survive four years with a training master she hates and her old nemesis, Priscilla. To make matters worse the unwanted attraction Ry feels for her sometimes-friend-sometimes-rival Prince Darren is at an all time high –even though he is betrothed to the very girl she can’t stand. I absolutely adored The First Year and immediately knew I had to read this one. The story picks up almost immediately where the last one finished off and I was happy to see that Ryiah was still having issues with those in power but still being herself. I was also super excited that there was more Ian because I loved Ian for the brief moments we saw him in The First Year. I did have some issues though. The plot was very good. I liked that we saw all of Ryiah's apprenticeship in this one and that the whole book didn't take place over two months like the last. It made it fast paced and fun to read without it getting bogged down with day to day ramblings. I also really liked the new and improved training sessions that focused on expanding the magic rather than creating it. This really helped the world building and it was nice to get a taste of all of the country rather than just one place. The overarching conflict of the brink of war was more prevalent this time and it made everything so much more tense and exciting. Until that first patrol battle, Ryiah (and the readers) were seeing the training as fun and exciting, but didn't see the consequences. I think this served as a good reminder that anything could happen to anyone at anytime. But I was saddened by the turn of events at this one. I think it served to grow Darren as a character, but it was also just sad. Ryiah tried to come into her own, but I felt she was kind of static in this one. There was the ever present wit and snark that is her trademark, but she didn't seem to really grow as a person as much as she did with her magic and training. I think part of that was because of my biggest problem -- the love triangle. Every young adult book seems to have them now, but this one irritated me. I think it as because I like Ian so much as a character and it felt like wasted potential for him to serve as Ryiah's other love interest and then barely be talked about after she chose Darren. And really, was she ever going to choose anyone other than Darren. I think what really irked me about this one was that to even start dating Ian, Ryiah had to steal him from Lynn. And she saw Lynn as a friend and still did this??? I was not impressed by that. The worst part was the constant back and forth. One minute she loves Ian, the next she is kissing Darren, but can't because she is with Ian. I loved Darren and Ryiah in the last book and was wholeheartedly cheering for them, but adding Ian into the mix made me wish that Ryiah and Darren would go jump off of a cliff. I feel like I would have liked this book more had it only been the "forbidden romance" aspect of it and not the love triangle that ended in breaking Ian's heart and therefore writing him out of the novel basically. Overall: 4/5. This one was SO good. I loved it but I was disappointed by some things. I would definitely recommend checking this series out though. I'm intrigued by this series, and currently reading this book. I got to the part where Ryiah stole Ian from Lynn and it makes me furious! I had to stop and google if someone else hated that scene as much as I did. So much for friendship. Feeling betrayed when Darren makes her betray Ian, but she goes ahead and betrays Lynn in another way that mattered. Willing to throw away friendship for love, when she herself is still mixed up in different romances. And if what your review has stated is correct, she ends up betraying Ian anyway? Ugh! I'll continue reading, but I hope this mess resolves itself soon. It pisses me off if the author just introduced these two just to have Ryiah get in a horrible love-triangle with them and write them off when she's done.